Daron Malakian's "heart not in it"
Daron Malakian "heart is not in touring"
Scars On Broadway have cancelled a tour of North America, with singer / guitarist Daron Malakian citing "personal reasons". The tour was due to commence on 19 October. "Malakian concluded that his heart wasn't into touring at this time, so he made the decision to cancel all scheduled performances." "I would never cancel a tour unless I had real reasons and personal things that require my undivided attention"
"I understand all of your frustration and anger, and I never meant to let any of you down. Your support for Scars has been so important to me and the band. I would never cancel a tour unless I had real reasons and personal things that require my undivided attention. The music of Scars will live on, but now is a time when aspects of my life need to be tended to. I hope all of you can understand." There are currently no plans to reschedule the tour, and ticket refund information will be posted soon. 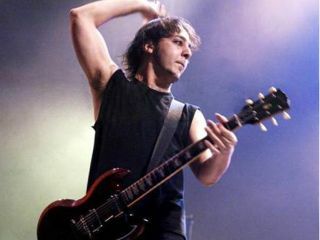 Malakian formed the band in 2006 with fellow former System Of A Down member John Dolmayan, and the pair released their self-titled debut album earlier in 2008.